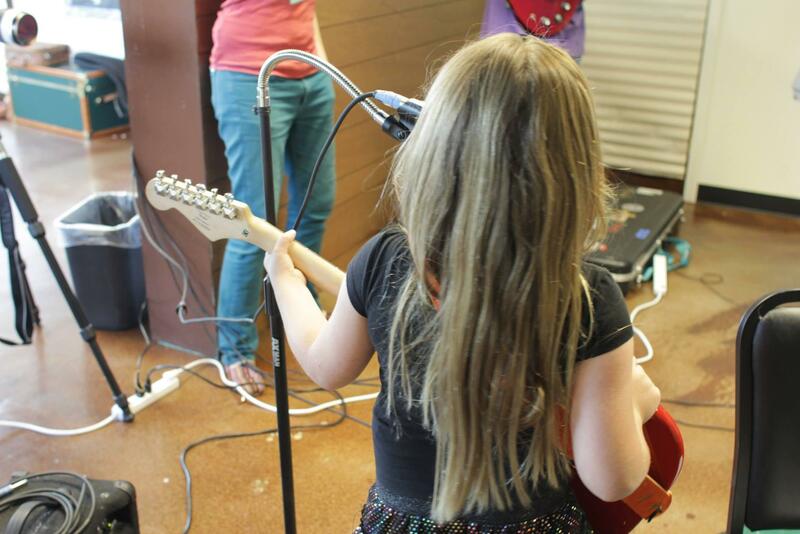 Fueled by the vision of Rock ’n’ Roll camps for girls in Portland and Tennessee, one Springfield group strives to empower young women through music and the arts. KSMU’s Theresa Bettmann tells us what’s in store for this year for the Queen City Rock Camp. "Girls just wanna have fun” isn’t just the title of a song, it embodies the environment and types of music girls can learn as part of a summer rock camp in Springfield. Girls ages 8 to 18 perform “Royally Rockin’,” an original piece created by a group calling themselves The Friendship Queens. The performance was one of many that occurred at the culmination of last year’s first week-long music camp. Queen City Rock Camp Program Director Hannah Sheehan says officials are gearing up again for this summer’s experience, which she says is a great opportunity for girls to experience music and the arts. “We want as many girls as possible who don’t have the opportunity to take music lessons. We want to show them what they can accomplish in a week. We want to build up a permanent gear library for Rock Camp that we can rent to them throughout the year so they can keep building those skills,” explains Sheehan. The camp is designed for beginners, says Sheehan, but youth of all skill levels are welcome. Girls begin learning an instrument of their choosing, form bands, and then put their skills on display during a showcase at the end of the week. Nora Powell’s band Neon Girls played their original song “Rock Pets” at last year’s performance. Powel, age 11, learned the bass at last year’s camp, and about some of rock’s greatest female artists. “We got to learn about famous women’s history--music wise--and we listened to 60s, 70s, 80s and 90s music. Female artists. My favorite was Blondie probably and my best friends really liked Janice Joplin,” Powell says. Powell says she has made more friends at Queen City Rock Camp than any other activity, and says her confidence is now at a new level. “I’m not as timid in front of people—I can talk to new people more easily than I did before. I can approach people more easily. Probably because I didn’t really want to perform in front of people and I did anyway and it was so much fun. And its fun talking to new people and fun doing stuff in front of people,” Powell says. Other music-related workshops at the camp instruct girls on recording and publishing. Hannah Sheehan wants to help them find ways to be involved in music even if being in a band is not for them. “Looking at the broader music industry, and the local music industry—the local music scene, there is a disparity and imbalance that needs to be addressed. And we want to address it not by just putting girl singers out there, which is where you see women in the music industry, but girl musicians, girl instrumentalists, girl record producers, girl everything—at every level,” Sheehan says. Self-defense and art are also a part of the curriculum, says Sheehan. Last year, the camp hosted 13 girls, this year Sheehan says they have room for 50. Registration for Queen City Rock Camp is currently open to returning participants, and general registration begins February 1st. Tuition is $200 for the summer camp and scholarship applications are available for those needing assistance. Sheehan says the not-for-profit hosts several fundraisers to provide these scholarships so every girl can have the opportunity. One day when she is older, Nora Powell says she hopes to be a volunteer or teacher in the program. For now, she just can’t wait for summer.